Somewhere along Highway 8 between Cambridge and Hamilton, I thought I glimpsed a weird-looking old tricycle / lawn-mower. Using a bicycle to make it easier to mow with a reel mower seemed like a terrific idea. To my surprise I found that such a thing appears to have never been mass-produced. 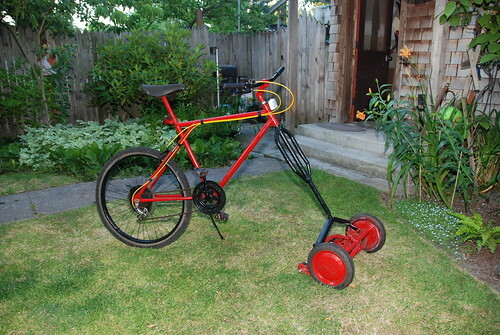 What I did find, however, was a gallery of such bicycle lawn mowers at TreeHugger. If you are handy then these are apparently not too difficult to construct. Lawn mowers (and their small-engine ilk) are the sources of some of the most annoying but ubiquitous sounds in all places with lawns, so I am all for people replacing them with quieter bicycle mowers — or even just regular reel mowers. Of course, they also don’t stink up the neighborhood, and I suspect they’re probably a fair bit safer.